Karriem Allah releases book that censors the “opponents” of the Honorable Louis Farrakhan; while explaining how the Honorable Louis Farrakhan, as the Messiah, is fulfilling aspects of the Messianic Prophecies of the Bible and Holy Quran. This book illustrates how the Honorable Louis Farrakhan has publicly declared, countless times—in words and deeds—that His mission, function and purpose are rooted in the fulfillment of the Messianic Prophecies described in the Bible and Holy Quran. For 30-plus years, the Honorable Louis Farrakhan has been among the most controversial public figures in America and throughout the world. He has received extraordinary adulation from millions of people, as well as ardent condemnation from opponents, particularly the mainstream news media and governments. 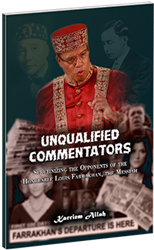 This book, “Unqualified Commentators,” goes to the root of the Honorable Louis Farrakhan’s divine mission and function; and by doing so, sheds light on the motives of His opponents. This book illustrates how the Honorable Louis Farrakhan has publicly declared, countless times—in words and deeds—that His mission, function and purpose are rooted in the fulfillment of the Messianic Prophecies described in the Bible and Holy Quran. These Prophecies encompass events that include the Coming of Allah (God), the Advent of the Messiah, the Redemption of Allah’s (God’s) Chosen People; and the Establishment of Allah’s (God’s) Eternal Kingdom on Earth. The Honorable Louis Farrakhan has maintained that He speaks from this vantage point, as the representative of Allah and the Honorable Elijah Muhammad; and not out of selfish desire. This book also shows how those condemning the Honorable Louis Farrakhan often omit information about His “self-declared” divine mission and function. How then can such persons be considered “qualified” in their commentaries about the Honorable Louis Farrakhan when they disregard the facts? Their motives, therefore, stand to be scrutinized. This book pursues this objective. Unqualified Commentators: Scrutinizing the Opponents of the Honorable Louis Farrakhan, the Messiah is available at the author’s website: http://www.kamuhammad.net or amazon.com, in paperback and ebook versions.